Purchased on the Stillman Fund, 2003. Sistine Chapel; looted by Napoleon's troops; Abate Luigi Celotti, who cuts up the choir books, made them into montages ca. 1826, and sold them at Christie's London, 26 May 1825, lot 73; Arnold-Peter C. Weiss, purchased from him on the Stillman Fund, 2003. 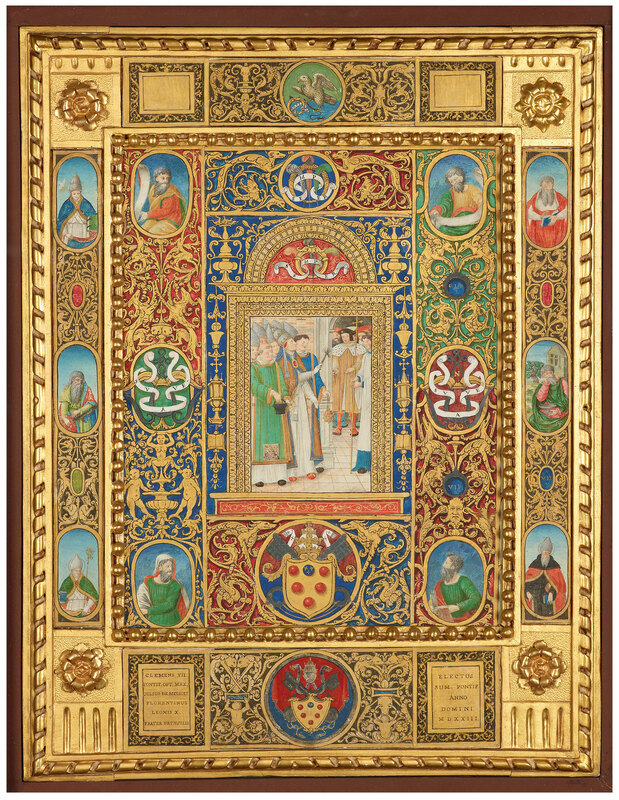 Ms. single leaf (composite), matted, in gilt frame; the source of the cuttings is one or more of the Missals of the Sistine Chapel commissioned by either Pople Clement VII or Pope Leo X, illuminated in Rome, 1523. Border strips contain the devices and monograms of Pope Clement VII (de' Medici). Decoration: 1 miniature depicting Pope Clement VII asperging the congregation before mass.